Nice... but how did he mange o go forward instead of fly backwards? looks like it's front wheel drive (big fronts with tiny back wheels)... Whatever happened, i suspect the engine/transmission failed in someway, it seems to have locked the front wheels... must have been like hitting a wall! Yeah that's definitely not what happened. I was there at the Maryland International Raceway. His transmission seized and locked the front wheels as #3 mentioned. I think your find that drag cars are rear wheel driven thus if he placed it in 1st gear it would lock up the rear wheels not the front. 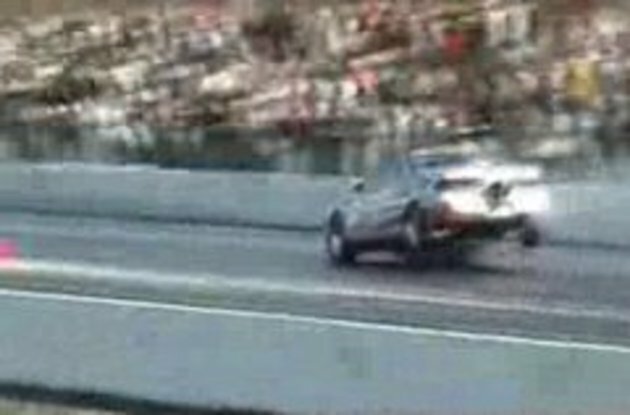 #8 Not all drag cars are RWD. As #(removed comment) stated there are different classes in drag racing. Radials on the front and skinnies in the back + parachute equals one seriously fast import. He is more than likely in the 10's. The FWD Gas Record is 8.558 at 162.93mph (Think about it this way: That car goes 0-160 as fast as the average street car gets from 0-60). It looks like from the video that his transmission bound up and locked the axles causing the tires to lock. It would be almost impossible for him to shift back into first from second at such a high rate of speed (if you have a manual car you know what I'm talking about). Turbo-charged imports FTW. Nothing like spooling up on a Corvette as you pass lol. No I'm saying it wasn't a shifting issue. The announcer explained what happened after the Integra was towed away. The transmission was in bad shape when he got there and broke, no miss shifting. wtf was that?!?! Heeell yeaaah!! Sounded like a true redneck. "Oh snap, mom's gonna kill me for wrecking her car!"